It’s a big day at Northeast Orthodontic Specialists when our patient’s braces are removed. It’s time to celebrate! But first, this is a reminder that braces are a huge investment and your orthodontic care does not end here. After braces are removed, a custom fit device called a retainer reinforces and stabilizes your new smile so your teeth don’t move. Our Doctors understand that most patients don’t want to wear retainers after orthodontic treatment and it is an annoyance. However, it is the most effective way to stabilize your teeth after treatment and the key to maintaining a healthy smile over the years. How long do you actually need to wear a retainer? Once your braces are removed, your teeth and the bone structure around them are adjusting to the new positioning. For this reason, we request you wear your retainer(s) both day and night for the at least a few months or even more depending on the original problem. You don’t need to wear your retainer(s) during meals and while brushing or flossing. As time goes on and the bone and gum tissue adjusts to your new smile, retainer wear is reduced to nights only. About a year after wearing it at night, you may be allowed to skip a couple nights out of the week. 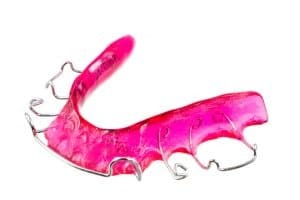 While you may be granted room to spread out the times in which you use your retainer, it is never recommended to completely stop using it altogether. Wearing your retainer at least a few nights per week, indefinitely, is best recommended to maintain the position of your new smile over a lifetime. While not as bad as braces, retainers often get a bad reputation due to their aesthetics and its effect on speaking. No one wants to look or even sound like they’re wearing a retainer. Luckily, with the latest improvements in 3D imaging and printing, many retainers can be fabricated and worn without being noticed. Clear, plastic retainers are a great option for the time directly following the removal of braces. They provide minimal visibility and can be worn both day or night and easily be removed for brushing and flossing. Lingual retainers are also an option. This type of retainer is placed on the back and sides of your teeth – making them non-visible. Permanence is what sets this retainer apart from the rest. You can’t lose something that’s already installed on your teeth! However, this is not an option for everyone. Your orthodontist will determine what retainer options work best for you. It is common to have questions about the next steps in your orthodontic care. Fortunately, you have access to an amazing staff with extensive knowledge and experience on your side. Contact our Cincinnati or Loveland OH office today to find out more about caring for your teeth after braces. Better yet, refer your family and friends so they can have a great smile also.